1983 Apple introduces the Macintosh and the age of desktop publishing arrives. 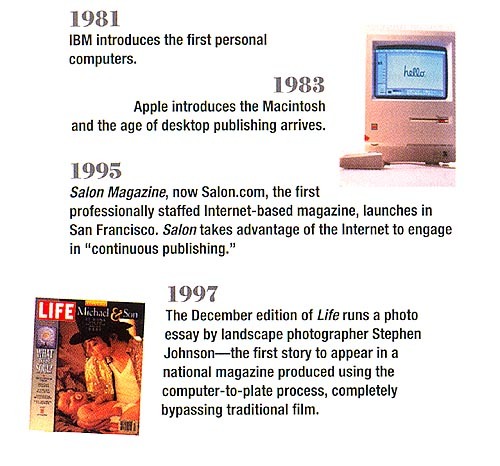 1995 Salon Magazine, now Salon.com, the first professionally staffed Internet-based magazine, launches in San Francisco. Salon takes advantage of the Internet to engage in "continuous publishing." If the 18th century is considered the period of magazine infancy, then the 1900s might be characterized as a teenage growth spurt. The solidifying roles of the various disciplines, establishment of industry standards ranging from objective circulation auditing to syndicated market research, and the impact of technology have had profound effects on magazines. Innovations during the last half of the 20th century, particularly the democratizing impact of desktop publishing, have swelled the ranks of magazines. The onrushing revolution-in CTP, in database marketing, in brand extensions and online-shows no sign of abating. And media vehicles like CD-ROM, the Internet and more promise to further recast what the magazine is all about. 1900 Printers agree that four subtractive colors-cyan, magenta, yellow and black-are needed to simulate a full-color image, introducing the four-color lithographic process. 1903 After 20 years in business, Ladies' Home Journal is the first magazine to break one million in circulation. 1906 The four-color press is invented by C.B. Cotrell & Sons. 1912 Photocomposition is invented by William C. Huebner. 1914 In its July issue, National Geographic publishes the first color photo of a flower garden. 1914 As a means to ensure the accuracy of magazines' circulation claims, the Audit Bureau of Circulations, ABC, is formed. 1923 Starch Research, the first market research firm, offers its services to the magazine industry. 1932 Family Circle is the first magazine to receive in-store distribution when it is made available on a complimentary basis to customers of the Piggly Wiggly supermarket chain. 1946 Cahners Publishing Company, one of the pioneers of controlled circulation and niche marketing, is formed. 1960 A.C. Nielsen introduces the first syndicated media market study. 1971 The Postal Reorganization Act gives the authority to set rates to the PRC instead of Congress. Publishers begin experimenting with alternate delivery. 1981 IBM introduces the first personal computers. 1997 The December edition of Life runs a photo essay by landscape photographer Stephen Johnson-the first story to appear in a national magazine produced using the computer-to-plate process, completely bypassing traditional film.